Jolla's first Sailfish-based smartphone will arrive in Q4 and cost €399. Finnish smartphone start-up Jolla will start shipping the first batch of its debut smartphone in its home country on Nov. 27. Operator DNA is organizing a launch event in central Helsinki where 450 of the people that pre-ordered the device will get it. Other customers who have pre-ordered will get theirs soon after and it will then become generally available next month, DNA said. Jolla, which means dinghy in Finnish, was founded in 2011 by a group of former Nokia employees who wanted to continue the development work the phone maker had done on the MeeGo operating system. Its first smartphone is for now just called the Jolla phone and has a 4.5-inch screen, an 8-megapixel back camera and LTE. There is also 16GB of integrated storage, which can be expanded using a microSD card. More important than the hardware, however, is the Sailfish operating system, which Jolla hopes will lure users away from competing platforms. To help boost the availability of apps, the OS will be able to run Android applications. On Wednesday, Jolla announced users will be able to download Android apps from the Yandex.Store, which features over 85,000 apps. Jolla also announced it will use map technology from Nokia's Here unit. Jolla has improved the touch navigation: users can swipe from either side of the phone to get back to the home screen and close an app by swiping from top to bottom. Users can also check for social updates in the so-called Events view, which is accessed by swiping up from the bottom of the screen. The 9.9 millimeter-thick phone has been designed to look like two thin slabs that have been bonded together. The OS can detect and interact with electronic components in the phone's back cover, which can be used to add features or content and change the look, a concept Jolla calls "the other half." Users can also change the color of the back with different snap-on covers. The start-up wizard lets users select the applications they actually want, instead of having a number of pre-loaded apps forced on them. 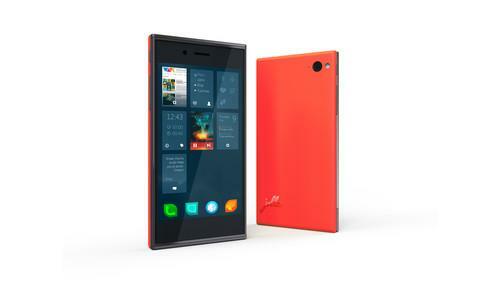 The Jolla phone will cost €399 (US$535) without a contract. Jolla didn't immediately reply to questions about availability in other parts of the world. In August, the company said the first production batch of its smartphones had been fully booked by consumers and selected sales channels in 136 countries.